Can we talk about this? All those times during the movies we were like "Does he never run out of arrows?" and then FINALLY it happens. Do you guys agree or disagree? 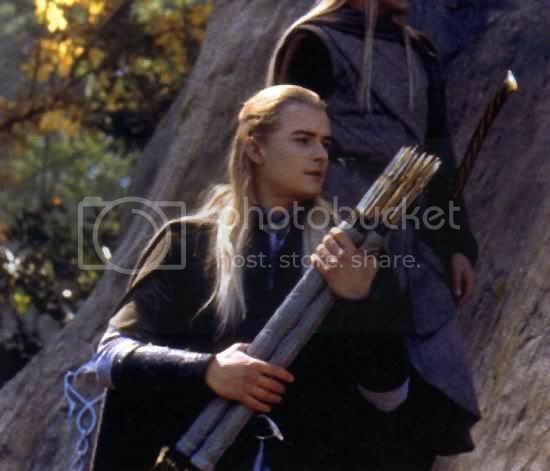 Does it make Legolas more realistic or too human? I have a pet hate for this whole topic. He runs out of arrows at Helms Deep in TTT, after he slides down the stairs. Has nobody ever noticed? That's definitely an empty quiver. He only uses his knives before they retreat back to the Keep where you'd expect there to be a whole stash of arrows anyway. There's more of a moment made of it in Bot5A which is probably PJ poking fun at everybody. It doesn't affect the character at all. It doesn't make him more human as he still kicks arse as effectively as before and there's literally no peril when he runs out we all know he's going to be fine. It's another cool 'Leggy Moment'. And running out doesn't necessarily make him more realistic either, he's not a bad shot or a wasteful one, so why would he run out? There's plenty of opportunity between battles in LotR to re-stock or collect old ones too. Yeah it's mentioned in TTT (book) by himself that he collects arrows from bodies when he runs out and as he shoots. Especially during battles, I can guarantee you that there would not be any shortage of arrows... he would literally be able to rip them right back out of bodies as he went, as well as scavenge other peoples' spent arrows. I figured that was common sense, I never realized it baffled people that much haha! I feel like showing him gathering arrows might have been a waste of screen time. I think there are some valid points on both sides. The fact that the books mention him collecting arrows off of dead bodies it a life saver for me! Other wise it would just be a urking inconsistency to me. In the movies, however, it does not show nor make that as clear so the whole thing in the BOT5A to me is a little like... "Right.... here of all places he just HAPPENS to be out o arrows." The timing is obviously suspense convenient. Personally I would have tried to figure out a different way for him to "not be able to save her." just because of the discussion (like this right here) I KNOW it will prompt. However, it does stand to reason, that he would run out of arrows eventually.... so I'm betwixed and between.